Some people wonder why, when I am so focused on working efficiently, that I hand hem my textiles. 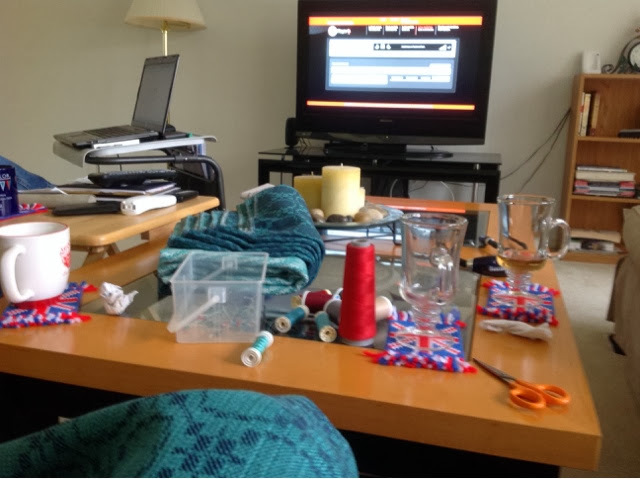 I would have to clear off my work table, at which I stand to work, dig the sewing machine out from storage, find multiple bobbins for all the different colours of thread to sew with, could not use the table for anything else until I put it all away again. The other reason is that I just prefer how the towels look. 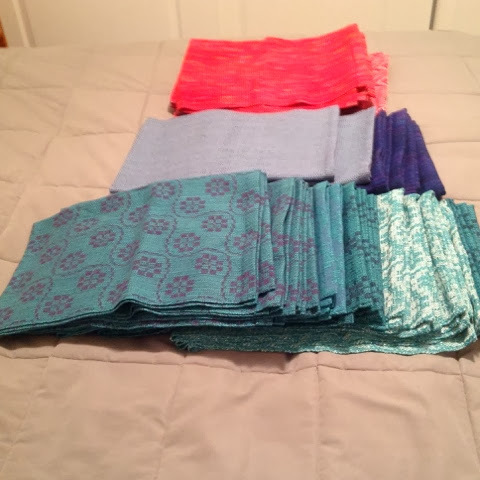 Here is a photo of some of the towels I have so far sewn during the trip. They still need their final press but that will wait until I'm back home. Listening to the soccer game between Fleetwood and Scunthorpe via the Internet. I am making a dent in the hemming pile. Doug brought a big stack of towels, etc., in his suitcase so I have lots to work on. Had to make a run to the store because I didn't have the right colours with me. Smoky Mountain Spinnery will be carrying a selection of my towels soon. 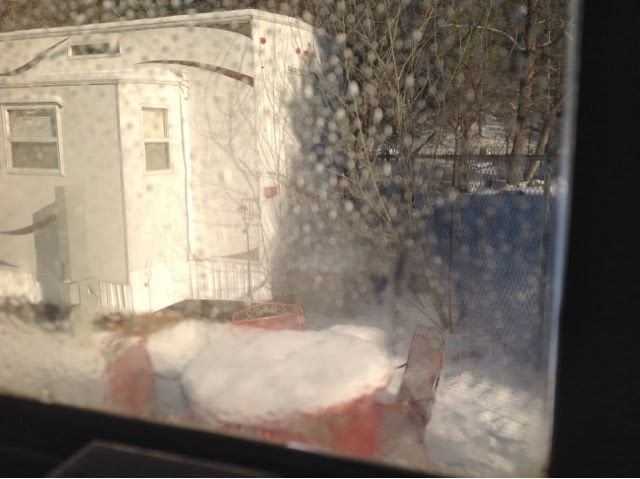 After several adventures with frozen pipes and hoses, we gave up even trying to stay in the RV and headed on into town and the welcoming arms (so to speak) of a motel with actual heat, running water of both flavours (hot AND cold) and working, ahem, comfort station. 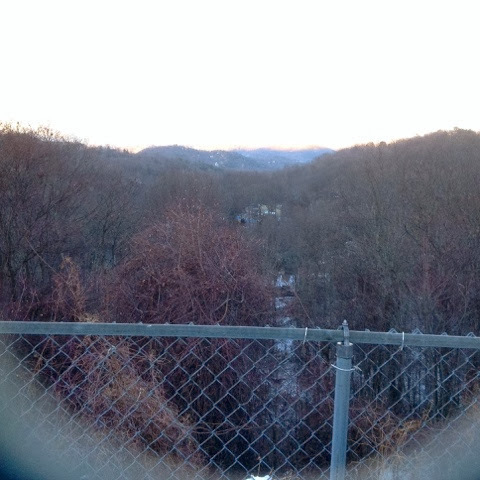 Just as the sun was disappearing behind the hills we headed up the mountain to Uber Gatlinburg where there is a ski hill and small mall. Another over exposed picture, this time of the sunset. There was a little colour in the sky which you can't see, but a view of the valley with Gatlinburg below might just be visible. It would be nice to visit when the trees are in leaf. Who knows, maybe that will happen some day. Yesterday on our trip to the hardware store I spotted a gizmo I thought might come in handy for threading/sleying. It is a hand's off light that hangs around your neck. For less than $15 I figured it was worth buying and if it didn't work for me, Doug could probably use it in his workshop. The light at The Spinnery was pretty good, but it was hard to see to sley so I whipped out the light and voila! It really did help. Guess this will remain in my weaver's toolbox after all. The loom had been hand made, quite possibly by Frances' grandfather and it is living in the visitor centre of Gatlinburg,TN. Unfortunately, the loom had not been treated well. It is a four shaft, six treadle loom. At some point someone had cut the warp off the loom but left the heddles threaded, preserving the pattern of the final warp woven on it. It was missing some relatively minor pieces so before we could do anything, a trip to the hardware store was necessary. The mechanism is a roller type counter balance set up but the main roller was missing. 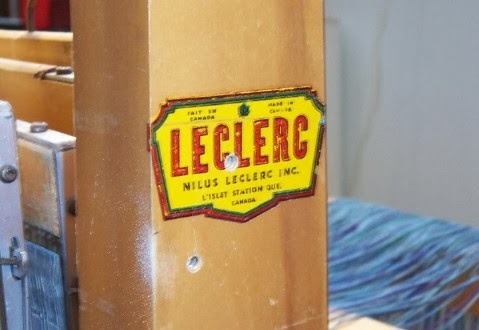 The heddles were still on the top heddle bar, but all the lower bars had come out of the heddles. 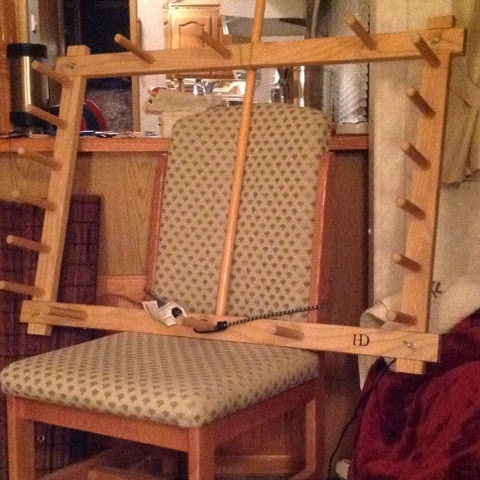 We installed the main top roller, then untangled the secondary rollers so that we could hang the top heddle bars. 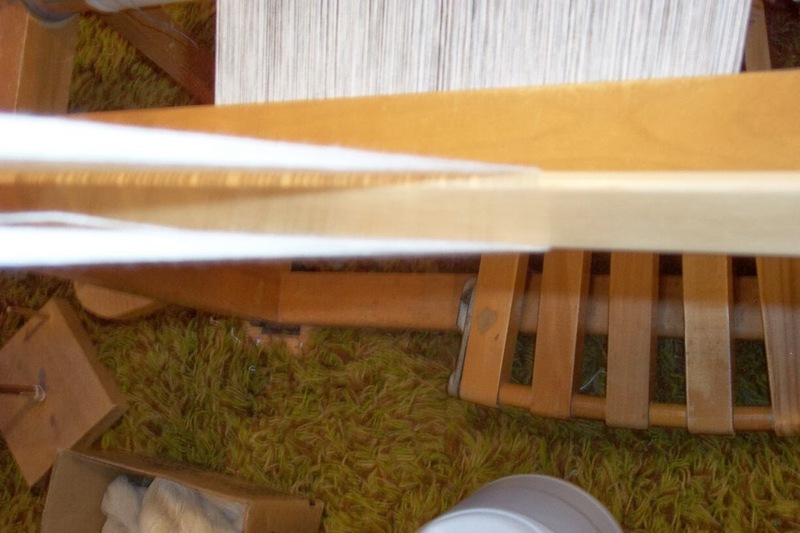 Then we painstakingly started putting all the heddles for shaft one onto the lower heddle bar. With a few anxious moments, shaft one was eventually sorted and we started on shaft two. 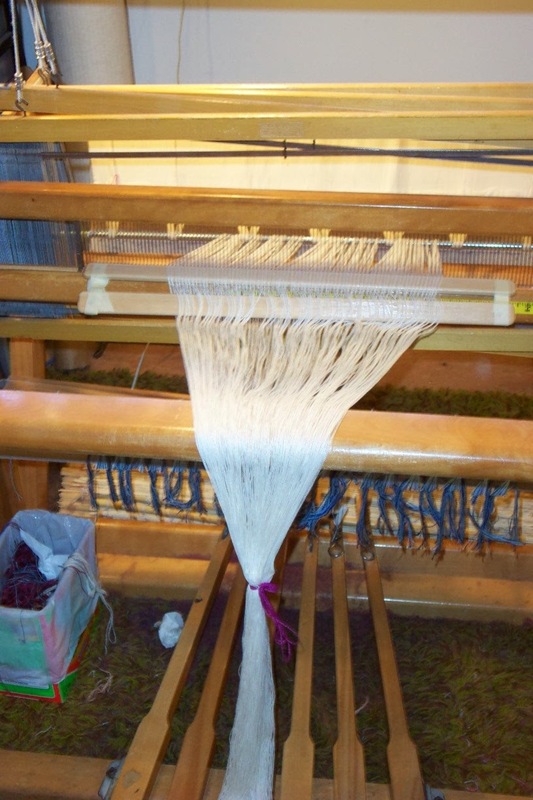 The heddles were in a tangle because of the preserved threading. 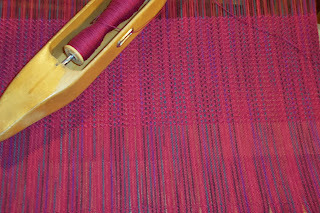 The warp ends were knotted together and it would have been a lot easier if we could have removed all of that last warp, but Frances really wanted to see what the last weaver had done so we persevered! Eventually we got shaft two done, heddle by heddle, then we moved to the back of the loom and started on shaft four. The only way to do without completely killing my back was to simply climb Into the 25" wide loom and sit on the treadles. Fortunately I'm pretty flexible! About half way through shaft three my shoulder started to protest so Cindy and I changed places. She was a much better fit in that tiny little loom! 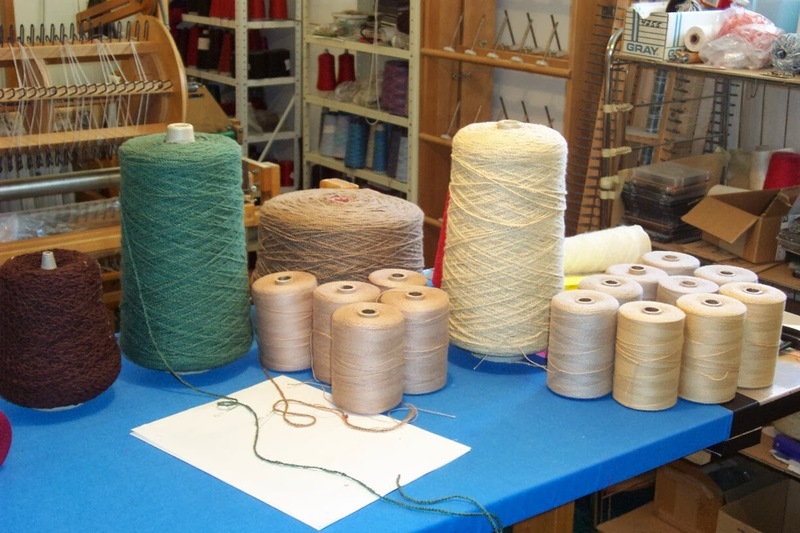 It took us about three hours from start to finish and at times we could have really used a fourth pair of hands as we juggled heddle bars and attempted to sort out heddles from warp. 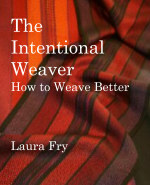 Frances will beam the warp and tie the new one onto the preserved threading and weave a bit to see what it is. The loom will stay at the visitor centre on display. But now it looks like a loom instead of a weird wooden contraption. And Cindy and I got some serious loom time! Seems I have not yet run far enough to escape winter! It sprinkled snow, sleet and rain yesterday, then began snowing in earnest around 8 pm. This morning we woke to -12 C temps while at home, much, much farther north it was just zero! It is supposed to stay cold all week, so perhaps I won't be sorry to leave and head for Florida on Sunday? Today we hope to have a little loom time, helping set up a demo loom as well as tour Arrowmont. 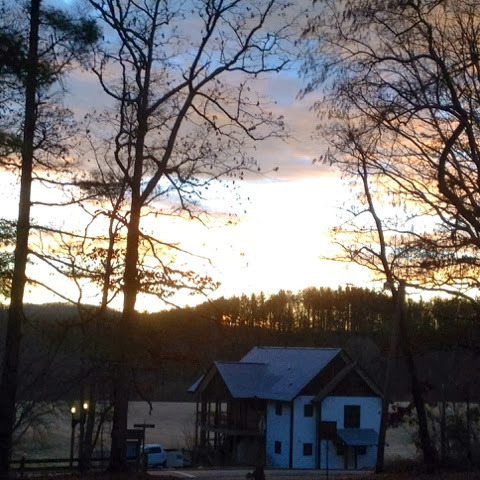 The snow has stopped and the sun is poking through the clouds off and on. The concern of the moment is that we have no hot water. It could be worse; we do still have cold. First priority was a big pot of coffee! Today we had a quiet day. We were both tired after a very busy week. There were seven in the weekend class, one complete beginner who had never woven before in her life, but managed to execute a decent set of samples. I have given her a contact in her home town, so hopefully she can get started weaving properly. Next year I am looking forward to seeing this part of the country in friendlier weather. Specifically June 7-12. I am hoping for another booking prior to split the travel costs. We are keeping fingers crossed that the predicted snow doesn't fall tomorrow so we can head north to Norris, TN to visit the Tuesday Weavers. In the evening The Spinnery in Gatlinberg has a drop in so we are hoping to meet some of the locals for an evening of crafts. Wednesday we plan to visit Arrowmont. They have an exhibit plus a tour of the weaving studio may be possible. The rest of the week we will just play by ear. At the end of class the school has a closing ceremony where each class can set up a display to share what the students have made during the week. 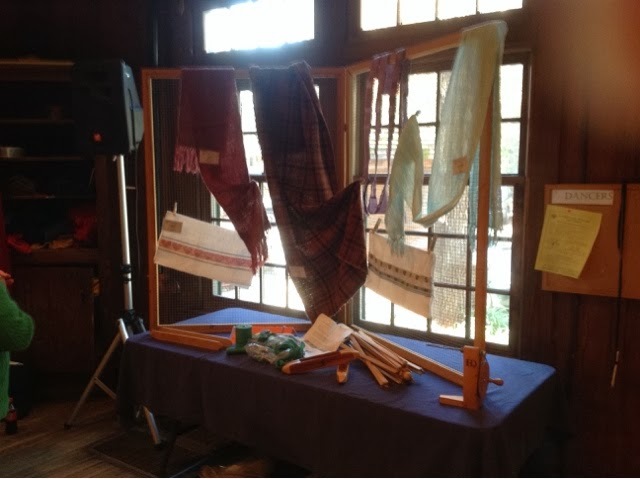 Two of the students wanted to leave before then so their work is not represented in the weaving display. But the Boot Camp class focus was on learning and improving skills, not necessarily on production. Still haven't figured out how to get photos from my iPad onto the blog, so no pictures. The group is small but enthusiastic. Lots of questions, lots of talking, exploring options. I haven't done much weaving as I field questions, keep a loose eye on everyone and dress looms for the weekend. I think I brought 10 warps; so far I've got three into looms, ready to weave. Started the fourth this morning, but between meeting with Pam and a group lecture, I didn't get very far. Fortunately Cindy is staying for the weekend and will help dress looms, like she helped to wind them last Saturday. Next year Pam and I agreed on a different time of year so I will be coming down in June. More details as they get hammered out. Day two is winding down. There have been ah-ha moments, some frustrations, some break throughs. Learning is a process of laying down layers of knowledge to create a solid foundation which allows more learning. Weaving is not difficult. It IS complex. In order to learn a student would do well to remember the maxim, use it or lose it. Setting aside 15 minutes every day to do something related to your craft will reap rewards. Trying to do it in marathon sessions months apart means constantly wallowing at the shallow end of the learning curve. Learning a new skill takes mindful practice, regularly. On a related note, I may be back at the folk school next year. Stay tuned. It was a glorious sunny day to make the drive to the Folk school. We arrived in good time, got the stuff unloaded, settled into our rooms and generally got comfortable. Two of the students will be arriving late, but the rest of us had dinner together, then went to the studio to get to know each other and settle into the space. The weather is supposed to be typical winter weather. In other words variable. But we will be happily ensconced in the studio, no meals to prepare or clean up. It is that time. Yes, not quite time to leave, but too little time to do much of anything. Anticipation builds. Will everything go off without a hitch? Will the weather co-operate? Will flights be on time? Will I get food I can eat? Did I bring enough emergency rations with me? Will I wake up at 5 am so I can catch my 8 am flight tomorrow? A few things I do know. I have lots of books. Probably too many to finish them all in three weeks. There is a big stack of hemming and Doug will bring more if there is room in his suitcase. 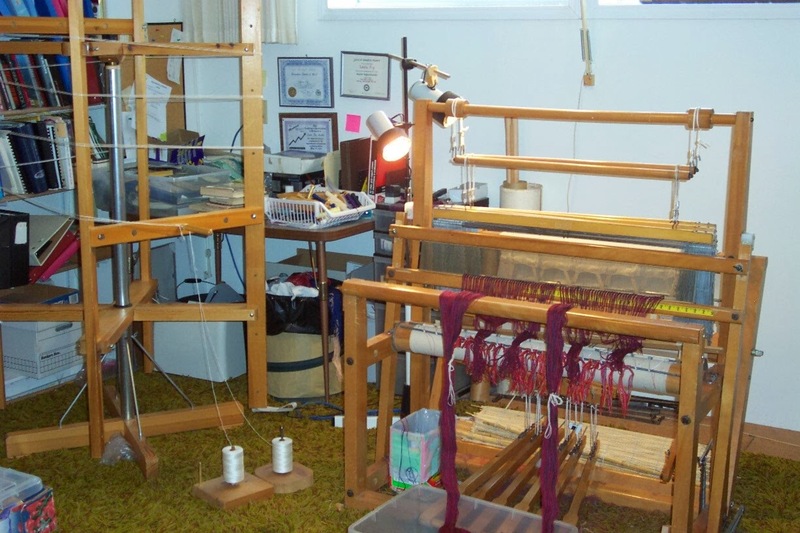 If the weather and driving conditions are good, Cindy has proposed a couple of road trips to visit with weavers in the region, so there will be lots of weaving talk and fibre friendly people to connect with. Jacqui has proposed a dolphin tour, again, if the weather co-operates. I am looking forward to the next three weeks, whatever the weather does because if it's nasty I have hemming and reading. If it is nice, people to meet and share my love of textiles with. Most if all, I hope to escape winter for a bit. However, it was interesting to see that there was some interest in a tea towel, too. And there is nothing to say that I can't actually do both now, is there? The other number of note on the page is the number of page views since the blog was started in August of 2008. I never in my dreams expected any sort of readership. In many ways the blog is a diary of my daily addiction to weaving. It's a way for me to record some of the thoughts that rumble through my brain while I work in the studio. Or think about weaving. Or dream about it. So thank you, dear readers. Thank you for coming along on the adventure. Thank you for your kind words in the comments section or in personal emails. It's been a rocky road at at times, but we all have them. It's part of the human condition. But knowing I had a cheering section sending positive energy and good wishes helped get me through the worst. One more sleep until I leave with an overnight in Vancouver, then onwards to North Carolina. I am keeping fingers crossed that the polar vortex currently plaguing the eastern part of the continent weakens and the temperature warms up. The intent was to run away from winter, after all. by grabbing the choke tie and gently pulling, the slack in the threads equalized so that the warp looked quite tidy by the time I was ready to insert the rod from the overhead warping valet and add a weight in the form of a half-filled gallon jug so that I could begin to wind the warp onto the beam. With the tendency of the warp to twist and grab onto a neighbour, I moved the lease sticks more easily by tipping the stick to open a bit of a shed and separate the two layers of yarn. 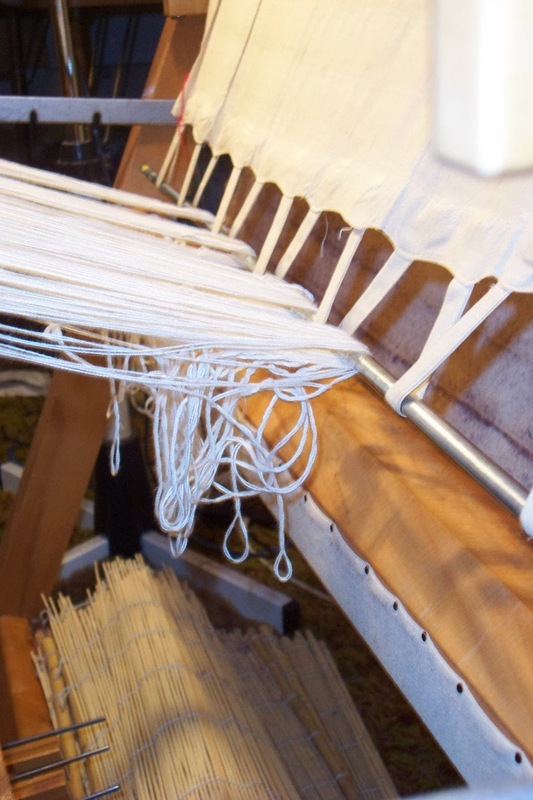 I use the lease sticks to clear and hold any errant ends at equal tension to the rest of the warp.by sliding them as far away from the beater as possible, then allowing them to move forward as the warp is being beamed. And yes, indeed, if the tangles are too persistent, I will even use a brush to help straighten the threads. Now I won't use a brush on every yarn, every time. Sometimes it isn't necessary as the yarn is more co-operative than this one. But if the yarn is strong enough, I will use a brush to make the beaming go more efficiently if necessary. There are all sorts of people who have just gasped in horror at this confession I am quite sure. I could carefully beam a warp without resorting to such tactics but it would take me a whole lot longer and I'm not a patient person. Nor do I have the time to coax my yarns into behaving. If they won't behave nicely, I will brush them if the yarn is strong enough and smooth enough. My bottom line is this: I have limited time in order to accomplish what I want to do. I am not going to waste time messing about with something when a little bit of brushing or finger combing etc., will give me decent results. I don't advise messing about with the brush, either. A quick swipe here and there to straighten ends is all it usually takes. Not all looms are crated equal. Nor are all yarns. And least of all, not all weavers are the same. 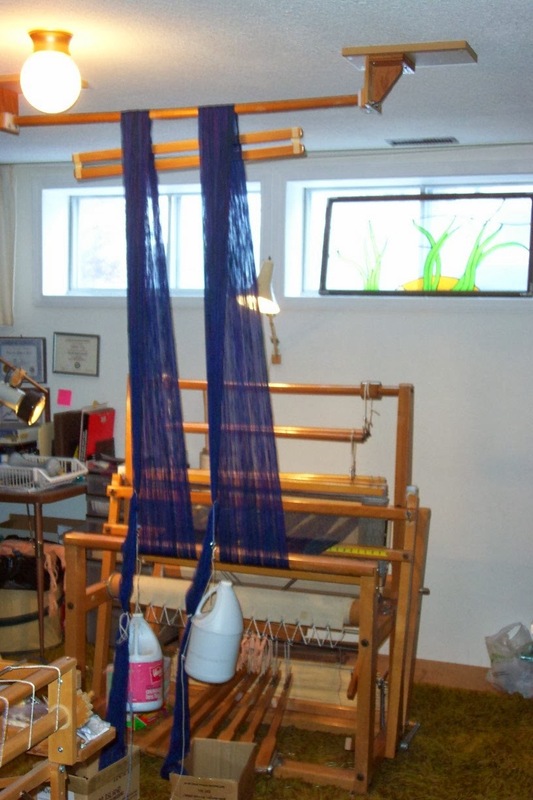 Learn as much as possible about the nature of the yarns being used, understand how the loom functions and most of all, learn as many different ways and about as many different tools as possible so that appropriate methods can be used for the situation in hand. Are you happy with your results? Great. If not, try something different. Do what is necessary to obtain the results you desire. Still trying to get everything done that needs to be done before I leave on Thursday. One of the things I finally got round to was bringing the Schedule page on my website up to date. While doing this I checked the Olds College Website and discovered that it's really truly official. 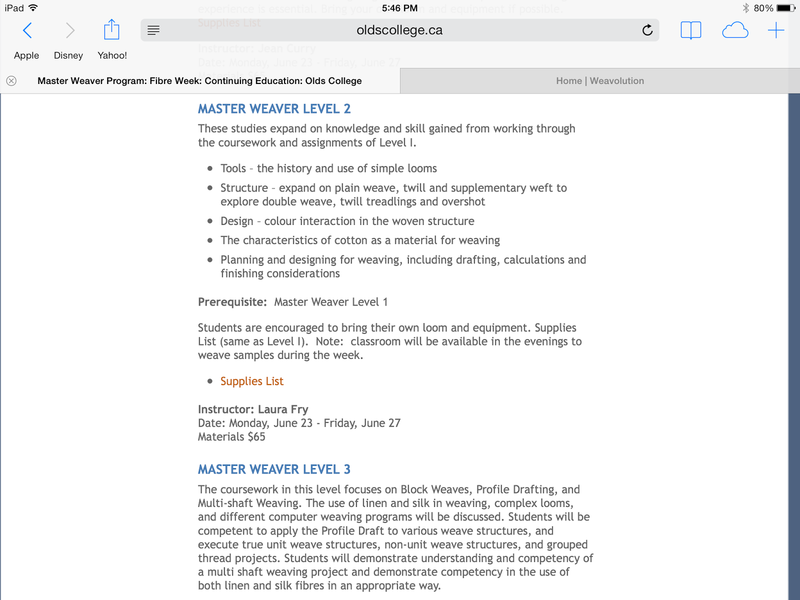 I'm slated to teach the Master Weaver 2nd level class in June. There are a few more details I need to clarify, but essentially everything from now to the end of June is listed on my website. I have also had a few inquiries for 2015 with some dates penciled in. As I confirm events I will try to remember to list those. Wound 7 warps to be dyed. Had a few issues with winding the first warp too long, then knots that had to be cut out, so ran out of yarn. I'd intended to have 8 warps, but oh well. That's life. Hoping to hear back from two people tomorrow so I can wrap up those items of concern, then find a hairdresser to give me a hair cut. Mine isn't able to fit me in before I leave and I simply cannot face dealing with my shaggy hair on the trip. In an effort to begin as I mean to go on, I sorted through about half the rubble on my desk. There is still a pile of paper to go through, plus the pile on the computer desk, but I can actually see desk surface. Win! As for the rest of the house, well, that looks like it's going to have to wait until I get home. My suitcase is open on the lr floor, the box of warps ready to go, several bins worth of Handwoven magazines I'll offer for sale at Fibres West in March, and various and sundry other things that will either go on the trip or are slated for March to be dealt with. I am fed up with clutter everywhere. I really want a house that is a lot more tidy than it generally is. But it's going to take effort on both our parts to get it there. Sounds like a plan for the coming year. Fanny arrived in my studio after being 'rescued' from an arts centre. She had been used - and abused - and at the time I didn't really think about her age too much. Doug retro-fitted a brake cable instead of the ratchet brake system she came with and as soon as she was ready to go she went into active service and I never really looked back. 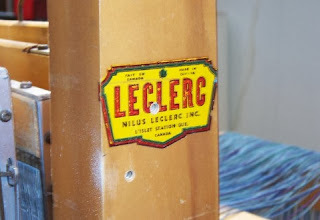 But I belong to a group on Ravelry called Leclerc Looms and there is a thread there about when various loom models were manufactured. After seeing the various iterations of the decals used over the years, I knew that mine did not fit into any of those categories. So I became curious. From the amount of wear on her we knew that she was 'elderly'. Also from the fitments - e.g. no shed regulator possible - the top roller just sits in slots in the top of the castle and the heddle bar keepers are just hooks, not the spring clips seen nowadays. In a fit of procrastination I took a photo of the decal and emailed Francois, not expecting any sort of answer for a few days. It is Saturday, after all! And the end of the holiday season. I knew there were people at work as I'd sent in a yarn order earlier in the week and gotten acknowledgement of that. Imagine my surprise when, within an hour of sending my question, Francois replied! My little 36" Fanny is venerable, indeed. He couldn't give a precise date but says prior to 1960. Apart from the modifications we did when we got her, it looks like everything except the treadle ties, also replaced recently, is original, including the aprons. Weave on, old girl! Weave on! I got up this morning determined to deal with the critical deadlines and by dint of fierce focus, managed to get everything done - except for one thing and that was because the website I needed wasn't up due to maintenance. Oh well. I did my part! But I'm getting mighty fed up with websites that don't 'recognize' me every month when I attempt to send in my report and have to apply for another new password, etc. 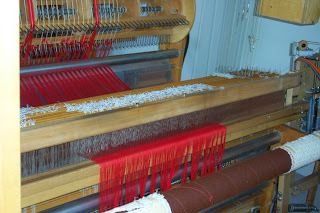 Today I expect to finish the red towel warp and install the blue one into the loom. Doug is off pressing about half of the red stuff already woven. There was too much for one day of pressing and I only do enough so that nothing is left over, damp in a bucket. I'm hoping he will be able to continue on the wet finishing while I am gone so that when I get home all I have to do is hem. But he may be busy with other stuff since Life Happened on Jan. 1. Family comes first. In an effort to continue stash busting Lynn's yarns, I decided to use up as much of these large novelty yarns as possible. I think they are cotton but would have to do a burn test to be sure. They will be combined with some 2/8 cotton and hopefully I might even get one of those warps woven off before I go, too. But I also have the warps for dyeing to wind, the demo warp for John C. Campbell to wind, pack and a few other things. But today is a sunny day. Yay! Meg has started a tradition of posting photos of one's looms on the first day of the new year. The AVL has the tatters of the very red Swedish Snowflake table runner warp left on it. I quite often don't bother stripping the dregs of the old off until I'm ready to put the next one on. Nothing sadder than a loom that is completely empty? Instead of dressing the AVL, I am setting the small loom up with the next of the towel warps. Here it is at 10:30 am, ready to be beamed. To the left is the warping mill. No, that's not a guide string on the mill but the first pass of the next warp. 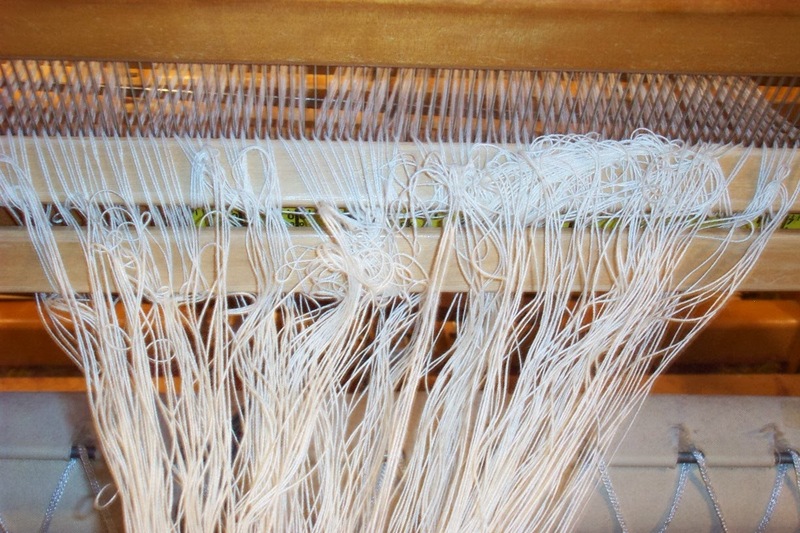 Just like with floating selvedges I don't use guide strings on the board or mill, just allow the first pass of the warp itself to be the 'guide'. And here is the cloth by 3:15 pm. Things went more slowly than usual today as we awoke to a rather large 'distraction' entailing lots of phone calls, emails etc. Mostly it was Doug affected, not me, but the general air of distraction served to keep me a little off balance, too. I did, however, get the planning calendar for 2015 started. Still have to go through the '14 one to make sure I'm not missing any dates. Like Fibres West - the intention was to apply for a booth there when we got home from Seattle in December but while doing the calendar this morning realized my round tuit must have gotten misplaced. So that will have to be done and into the mail tomorrow. I'd intended to apply to present a seminar but may be too late now. At least the looms are not completely empty. With any luck I can keep them going for the coming year. I do have a rather large stash to weave up after all.